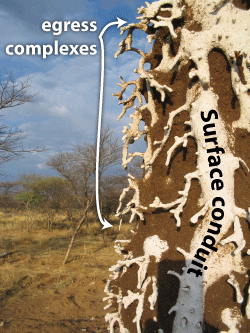 The mounds of macrotermitine termites have stereotypical architectures, yet are highly variable in structure. All species locate their colonies underground, where they cultivate fungi that aid in cellulose digestion. 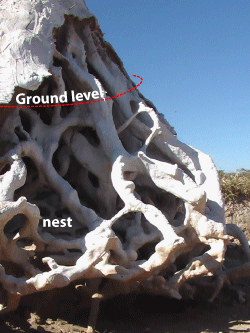 The mounds enclose a ramifying network of tunnels that forms a respiratory gas exchange system for the nest. 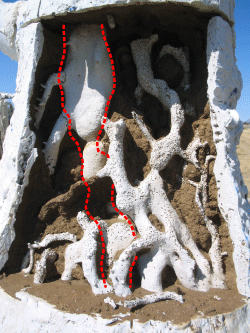 Some species may build open chimneys or vent holes into their mounds, while others build completely enclosed mounds that exchange gas through porous thin-walled tunnels (like the Macrotermes mound to the right). Even within populations, the variation of mound structure is prodigious. A mound that has grown up around a Boscia tree. a columnar spire atop a conical base. The spire reaches on average about 3 meters high, but it can reach as high as 9 meters. a broad outwash pediment, roughly 10-20 meters in diameter, consisting of soil eroded from the mound. A distinctive feature of these mounds is the northward tilt of the spire. At our study site in northern Namibia, this tilt is about 19 degrees on average, which corresponds to the average zenith angle of the sun (and to the latitude). 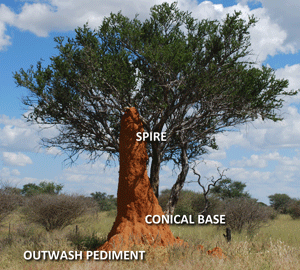 The spire's northward tilt is probably due to termites building more avidly on the warmer north-facing surface of the mound (remember that Namibia is in the southern hemisphere). You can read more about this, including a video of how it happens, here. Underside of patch of new building revealing egress complex (above) and entrance hole to surface conduit (below). The mound surface appears to be solid and impermeable, but it is actually quite porous. 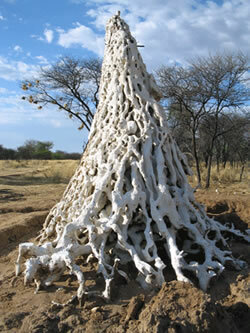 The porosity arises from the method that termites employ to grow the mound. 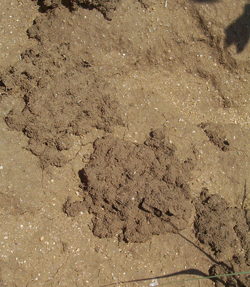 The mound grows by termites transporting soil onto the mound surface and depositing it there (three videos below of a mound building in the rainy season illustrates this). To get to the surface, termites dig numerous egress tunnels from the surface conduits to the mound surface. Notice how the deposition of soil to the surface is episodic. This typically occurs following rainfall events. 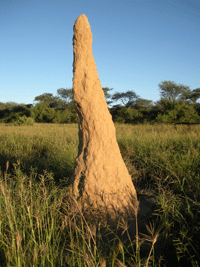 This is an important clue to why the termites actually build a mound. 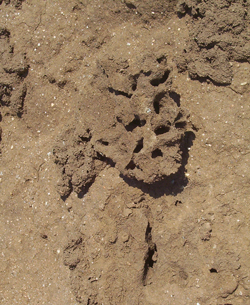 Deposition of new soil onto the surface is evident as patches of moist or rough deposits of soil (right). These new deposits are quite friable and air moves through them with relative ease. These patches of newly deposited soil open directly into the egress tunnels, which is revealed when a patch is removed. The mound therefore has a dynamic surface. 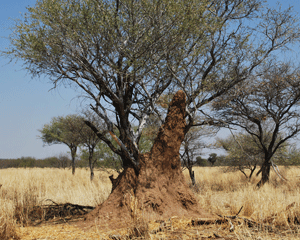 As soil is eroded from the actions of wind and rain, it is replaced by the action of termites depositing fresh soil. 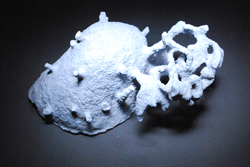 This makes the mound structure malleable, which allows it to be modeled to local conditions. The turnover of soil in the mound is seasonal, occuring solely during the rainy season. It is also quite prodigious, amounting to about 250 kg dry mass of soil annually. It is for this reason that these mounds have been likened to slow-motion "soil fountains." The relatively simple external architecture masks one of the most sophisticated animal-built structures on the planet. Inside themound is an extensive reticulum of tunnels and conduits, which reveals its function: the mound is an organ of physiology for the termite colony superorganism, which is centered on the underground nest. 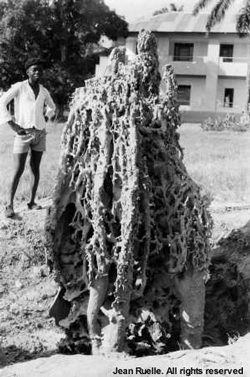 The nest itself is a spheroidal structure consisting of numerous gallery chambers, each of which contains a fungus comb, where raw forage, such as grass and wood, is digested by the symbiotic fungi (Termitomyces) that the termites cultivate within their nest. This network of tunnels is most easily made visible by casting them in plaster and then washing away the soil. The first to do this was the Belgian entomologist Jean Ruelle (below), who cast the tunnel network of a Macrotermes natalensis mound in concrete. More recently Rupert Soar (of Loughborough University) and I have cast the internal tunnel network of Macrotermes michaelseni. You can see more about this on the Endocasting page. As in Ruelle's cast, the tunnel network of the M michaelseni mound consists of an elaborate reticulum of surface conduits (middle) overlying a more extensive reticulum of large-calibre deep tunnels. the egress complexes underlie sites of active building at the mound surface, and emerge from the vertically oriented surface conduits. At sites of active building, these can be extensive and tortuous. Egress complexes can be found over the entire surface of the mound. the surface conduits run vertically underneath the mound's outer surface. Egress complexes spout from the surface conduits all along the conduit's length. The surface conduits also extend below ground to form the paraoecie. This structure envelops the nest, and offers egress from the peripheral chambers of the nest. The paraoecie also merges with the network of foraging tunnels that radiates as far as 70 meters from the nest. The subterranean conduits also connect peripherally with the air spaces of the nest. An amorphous large internal air space, the chimney, extends nearly the vertical length of the mound. The image one conjures is of a large pipe extending from the nest up through the mound. In fact, it ramifies and branches, so that it blends seamlessly into the large network of the mound's tunnels. Below, it penetrates into the center of the nest, and connects to the nest's central air spaces, through tiny holes. 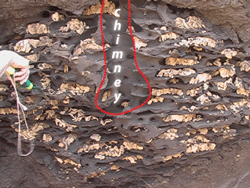 The chimney is excavated from abandoned fungus galleries. the reticulum is an interweaving network of tunnels that spans the chimney and surface conduits.